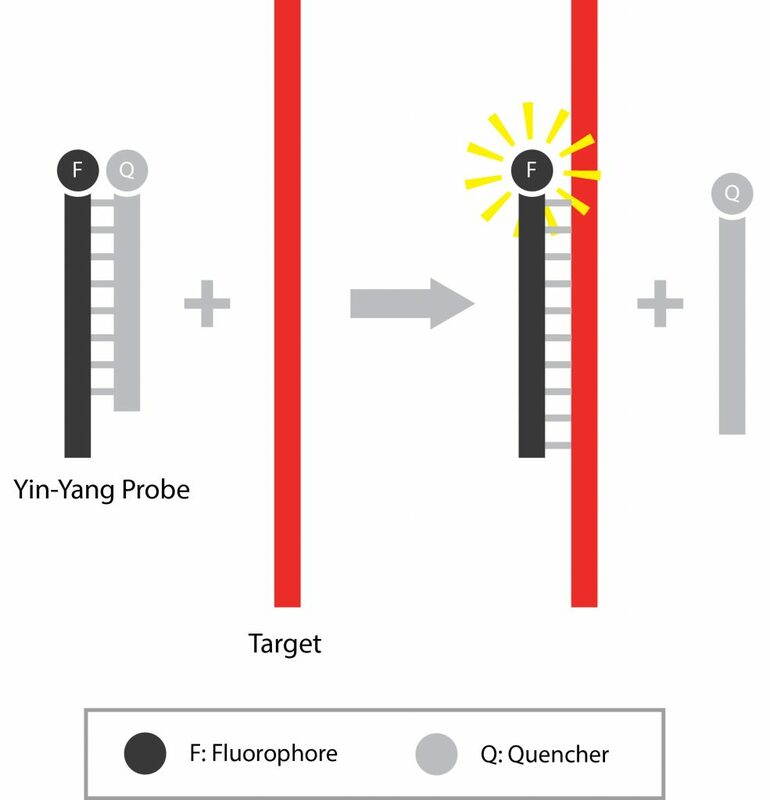 QuanDx’s exclusive technology is based on specially designed Yin-Yang Probes (“Displacing Probes,” or “Double-stranded Probes”) for nucleic acid detection. Applicable to a number of disease states and testing needs, the proprietary Yin-Yang Probe design allows for the development of cost-efficient, high specificity diagnostic kits for infectious diseases, genetic disorders, cancer, food pathogens, and beyond. To date, the Yin-Yang Probes are utilized in QuanDx’s state-of-the-art tests for hematologic malignancies, solid-tumor cancers, and infectious diseases. 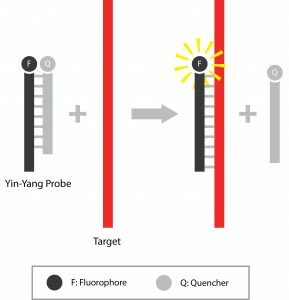 Yin-Yang Probes specifically detect nucleic acid in a homogeneous format and can be used for real-time nucleic acid amplification detection assays. The probes are composed of two complementary oligonucleotides of different lengths. One probe is labeled with a fluorophore and the other with quencher or fluorescence acceptor. Under suitable conditions, the probes are double-stranded. Probes according to this invention can comprise DNA, RNA, or mixtures of the two, and can comprise non-natural nucleotides and non-natural nucleotide linkages. Their 3’ ends may be blocked to prevent extension. Today, the Yin-Yang Probes platform is backed by over 12 years of development and many peer reviewed publications. Simple and easy design: There are no additional requirements for the original reaction system when designing double-stranded probes. Designing Yin-Yang Probe design itself is significantly easier than current dual-dye-labeled probes or adjacently hybridizing probes. Probes can be designed by anyone familiar with conventional probe designs. Cost effective synthesis: The labeling procedure involved in preparation of strands for double-stranded probes is only single-dye modification, which can be carried out in any DNA synthesizer without additional technical requirements. Purification involves only one step, making the Yin-Yang Probe design superior to other dual-dye-modification of probe strands or internal modification of probe strands, where multiple step modification and purification are needed, and the final yield is greatly reduced and therefore more expensive. High specificity: It has been well documented that structure-restricted probes possess higher specificity than conventional linear probes. Double-stranded probes are a kind of structure-restricted probes in this context. The probes can bind to their target only when the free energy produced is greater than that of the double-stranded probe. If there is mutation in the targets, the double-stranded probe may keep its own double-stranded state without any reactions that are thermodynamically unfavorable. Multiplexing: Simultaneous detection of multiple clinically related genes plays an important role in today’s healthcare. While Tm multiplexing meets a tremendous technical challenge both for primer set optimizations and for instrumentation, color multiplexing can easily detect 5-6 mutation simultaneously. 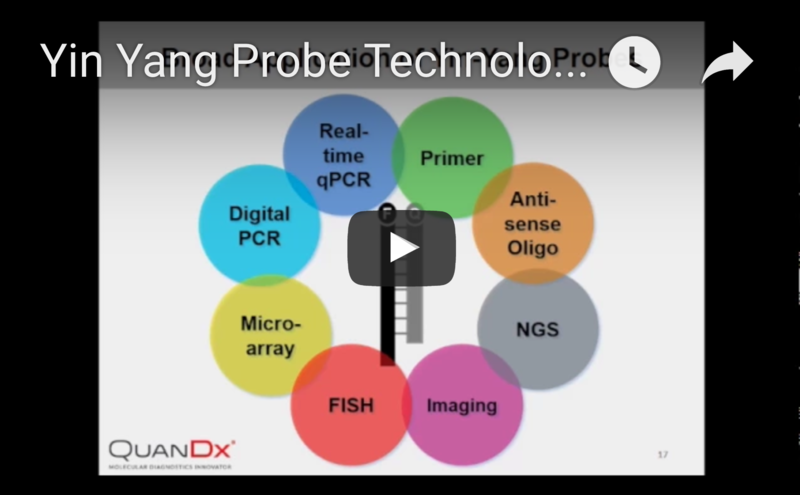 By combining Yin-Yang Probes and color multiplexing, QuanDx is able to provide a flexible approach to satisfy a variety of stringent requirements in practical use. 2. A new class of homogeneous nucleic acid probes based on specific displacement hybridization. Li Q, Luan G, Guo Q, Liang J., Nucleic Acids Res. 2002 Jan 15;30(2):E5. 3. Real-time PCR genotyping using displacing probes.Cheng J, Zhang Y, Li Q. Nucleic Acids Res. 2004 Apr 15;32(7):e61. 4. Real-time PCR detection of multiple lamivudine-resistant mutations with displacing probes in a single tube. Wen H, Li Q. J ClinVirol. 2007 Apr;38(4):334-40. Epub 2007 Feb 27. 5. Multicolor real-time polymerase chain reaction genotyping of six human platelet antigens using displacing probes.Ruan L, Pei B, Li Q., Transfusion. 2007 Sep;47(9):1637-42. 6. Real-time PCR genotyping of aldehyde dehydrogenase-2 using displacing probes.Gu Y, Li Q. ClinBiochem. 2007 Nov;40(16-17):1325-7. Epub 2007 Aug 10. 7. Multicolor real-time PCR genotyping of ABO system using displacing probes.Ruan L, Zhao H, Li Q. J Forensic Sci. 2010 Jan;55(1):19-24. Epub 2009 Dec 2. 8. Molecular diagnosis and targeted therapy of a pediatric chronic eosinophilic leukemia patient carrying TPM3-PDGFRB fusion. Li Z, Yang R, Zhao J, Yuan R, Lu Q, Li Q, Tse W. Pediatr Blood Cancer. 2011 Mar;56(3):463-6.